No remorse. Murtha defends slandering innocent US Marines. 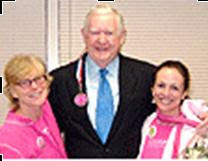 Code Pink co-founder Gael Murphy and DC coordinator Allison Yorra award Congressman John Murtha with their highest honor, the Pink Badge of Courage, and thank him for his courageous antiwar stand on Iraq in 2006. U.S. Rep. John Murtha stands by a controversial remark he made previously that U.S. Marines killed women and children “in cold blood” in Haditha, Iraq, in November 2005. The blunt description changed how American troops engaged Iraqis and improved overall conditions in the war, Murtha, an 18-term Democrat from Johnstown, said today during a wide-ranging interview with Tribune-Review reporters and editors. “It’s my obligation to speak out. I try everything I can to get things done,” Murtha said. A former Marine involved in the Haditha incident has sued Murtha for slander, saying in a federal lawsuit that his reputation was damaged by the congressman’s televised comments in May 2006. 7 of 8 marines who have now had their charges dismissed. Photos via Defend Our Marines. John Murtha slandered the Haditha Marines when he gave several interviews after the inaccurate story broke in TIME Magazine saying that the US marines killed innocent civilians in cold blood. It was later discovered that the story was fed to the media and Murtha by radical Islamists in Iraq. ** You can donate to Murtha’s opponent Republican William Russell, who lost a son in Iraq, Here. UPDATE: Murtha also said his district in Pennsylvania is full of racists. Was that supposed to impress the voters? And, didn’t Barack Obama say something like that a couple months ago?